A regrettable oversight led to the publication of a quote attributed to Adolf Hitler in this year's Bangor High School yearbook, the school's principal said this week. BANGOR, Maine — A “regrettable” oversight led to the publication of a quote attributed to Adolf Hitler in this year’s Bangor High School yearbook, the school’s principal said this week. 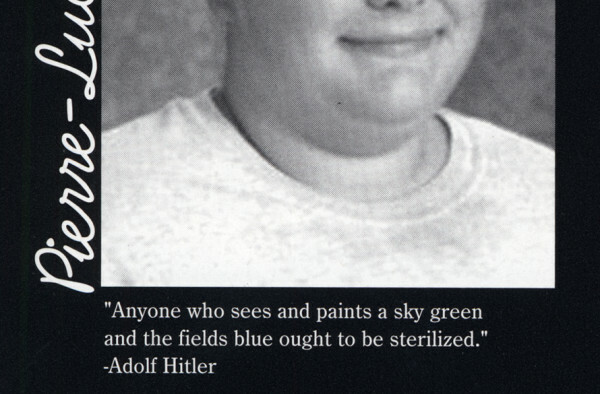 The quote, “Anyone who sees and paints a sky green and the fields blue ought to be sterilized,” appears under a photograph of a senior student, and it was attributed to the Nazi leader who was responsible for the deaths of millions and forced the sterilization of hundreds of thousands. Bangor High School Principal Paul Butler said he learned of the quote in the yearbook on May 26, after the school started distributing the publication to students. He said he immediately investigated to find out how and why the quote appeared. “I have determined that flaws in the submission and review timeline and process, not flaws in judgment regarding the appropriateness of including such a quote, are the cause of its regrettable appearance in the book,” he said in an email sent Tuesday night. When asked Wednesday to describe the yearbook oversight process, Butler responded via email. The school also sent out letters requesting that students bring their yearbooks into the school’s main office to apply a sticker. Stickers will be mailed to any students who have a yearbook but haven’t come in to get their sticker, Butler said. The student who submitted the quote to be used under his photograph, Pierre-Luc Bouchard, did not respond to a message from the BDN requesting comment. The quote is widely available on the Internet, but its authenticity could not be verified. Hitler expressed a similar view in a 1937 speech, according to the website German History in Documents and Images. Hitler reviled impressionism, expressionism, cubism and other styles of art that portrayed their subjects in a surreal fashion. He was an aspiring artist, and often railed against certain styles of art that he deemed ridiculous or offensive to taste, calling them “degenerate.” His own application to the Vienna Academy of Art in 1908 was rejected, and as a young man in Vienna, he ended up in a hostel for the homeless. After his failed artistic endeavors, Hitler found a new purpose, joining the Bavarian Army, fighting for Germany in World War I. He’d later use that experience to climb the German political hierarchy, building the Nazi Party into the military machine that would spark World War II. After Hitler came to power, certain types of artists became one of his party’s many targets. Censorship was rampant. Many artists were interrogated, vilified, imprisoned or closely watched. One painter, Alphonse Mucha, died in 1939 after a “questioning” by the Gestapo, according to the Mucha Museum. Around 1934, Germany began the organized process of sterilizing “undesirables” — largely disabled individuals and people who showed signs of mental illness. Before the end of the war, an estimated 400,000 people were sterilized, according to the United States Holocaust Memorial Museum. Hitler’s Nazi regime would murder an estimated 6 million Jews during the Holocaust. An additional 5 million members of other ethnic groups, disabled individuals, homosexuals and others also were put to death. The yearbook situation at Bangor High School is not unique. Just last week, a Pennsylvania high school dealt with the fallout of discovering that quotes attributed to Hitler, murderous Soviet dictator Joseph Stalin, and Abu Bakr al-Baghdadi, the leader of the Islamic State militant group, were published in its yearbook. The school said it reviewed the quotes but didn’t note the attributions until after publication. It offered stickers to cover up the quotes and offered refunds to any students who didn’t want the yearbooks anymore. The principal’s decision sparked discrimination complaints and ultimately was overturned by the superintendent, allowing the quote to be published. When asked about the First Amendment implications of removing the Hitler quote or preventing the student from using it, had officials noticed it in advance, American Civil Liberties Union of Maine spokeswoman Rachel Healy said the issue was cloudy.